“The bill would authorize DOC to charge a user fee for providing certain civil space situational awareness services, beyond a basic set of such services and information,” the analysis noted. “Those user fee collections would be recorded in the budget as reductions in direct spending. “CBO has no information on whether or how DOC would collect any user fees, who might pay the fee, or when it would be imposed. Thus, CBO has no basis to estimate the direct spending effects of the bill,” the document added. The CBO analysis is reproduced below. H.R. 6226 would direct the National Aeronautics and Space Administration (NASA) and the Department of Commerce (DOC) to implement programs in space situational awareness and traffic management. CBO estimates that implementing H.R. 6226 would cost $127 million over the 2019-2023 period, assuming appropriation of the authorized amounts. Enacting H.R. 6226 could affect direct spending; therefore, pay-as-you-go procedures apply. The bill would authorize DOC to charge user fees, which would be recorded in the budget as reductions in direct spending. How, when, or whether the proposed fees would be collected is unclear; as a result, CBO has no basis to estimate the bill’s effect on direct spending. The bill would not affect revenues. CBO estimates that enacting H.R. 6226 would not increase net direct spending or on-budget deficits in any of the four consecutive 10-year periods beginning in 2029. H.R. 6226 contains no intergovernmental or private-sector mandates as defined in the Unfunded Mandates Reform Act (UMRA). The estimated budgetary effect of H.R. 6226 is shown in the following table. The costs of the legislation fall within budget functions 250 (general science, space and technology) and 370 (commerce and housing credit). For this estimate, CBO assumes that H.R. 6226 will be enacted near the end of 2018 and that the authorized amounts will be appropriated in each year. Estimated outlays are based on historical spending patterns for the affected activities. 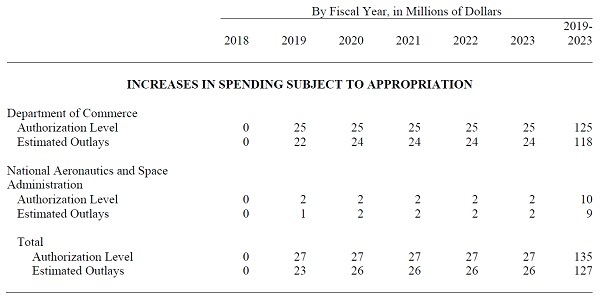 CBO estimates that implementing H.R. 6226 would cost $127 million over the 2019-2023 period, assuming appropriation of the authorized amounts. H.R. 6226 would direct DOC to establish a program that provides basic space situational awareness information to commercial entities, states, and foreign governments. (The Department of Defense currently operates a similar program.) The bill also would require DOC to establish a pilot program to implement voluntary civil space traffic coordination guidelines. The bill would authorize the appropriation of $20 million annually to implement the civil space situational awareness program, and an additional $5 million annually to develop and implement the pilot program. CBO estimates that implementing those provisions would cost $118 million over the 2019-2023 period. H.R. 6226 would direct NASA to establish a research center to promote research on civil space situational awareness and traffic management. The bill would authorize the appropriation of $2 million annually to establish and support this research center. CBO estimates that implementing this provision would cost $9 million over the 2019-2023 period. H.R. 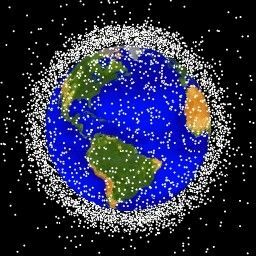 6226 would direct NASA to submit to the Congress a plan for civil space situational awareness and space traffic management. The bill also would require DOC to publish voluntary guidelines for civil space traffic coordination and to submit various reports to the Congress. Based on the costs of similar tasks, CBO estimates that implementing those provisions would cost less than $500,000. The bill would authorize DOC to charge a user fee for providing certain civil space situational awareness services, beyond a basic set of such services and information. Those user fee collections would be recorded in the budget as reductions in direct spending. CBO has no information on whether or how DOC would collect any user fees, who might pay the fee, or when it would be imposed. Thus, CBO has no basis to estimate the direct spending effects of the bill. The bill would not affect revenues. H.R. 6226 contains no intergovernmental or private-sector mandates as defined in UMRA. The 2019 US Coast Guard budget is proposed at over $11 billion. These beginnings of a US Space Guard in the Dept. of Commerce, at $ 127 million are around 1 percent of that. This seems reasonable, assuming that space commerce is allowed to grow. Yes, an investment that is long over due. Yup, looked another way, you could buy 2 new Falcon 9 launches with some change for that or almost one Falcon Heavy launch with FAR based extra expenses. So for the industry it is going to protect and facilitate, that is proportionally pocket change.